Leukemia has only one goal - kill. Last chance to save Kamil. White hospital corridors, the smell of medicines and disinfectant in the air. Dripping chemo and mother's tear-filled eyes. That's today. How was it yesterday? It was a normal teeenager's life. There was football and a gang of friends, there was school and first girlfriends. There was a smile, there was a life. Today there's dying. It was th mother who first saw that something was wrong, as she always did. She always knew, before he could tell her. She didn't think that this time, for the first time in her life, she wouldn't be able to help him, she would feel helpless in the face of his illness. Kamil became apathetic, gloomy. Until a short while ago he wanted to be the best in his class. He was talented and really ambitious, but then he got worse grades. He didn't care about grades, he didn't care about anything. It looked like a typical teenage rebellion, but there was something else. Back pain that made him unable to bend over. This pain didn't let him play football, it took away his joy of life. It all started with this pain. First, there was a blood test and X-ray. The doctor acted as a man who has no time for such a rubbish as a boy with back pain. With opinionated voice, he said that Kamil was simulating. But the pain was real and it wouldn't let go. Neither rest nor physical rehabilitation helped. He wailed, but he kept fighting, cause he wanted the pain to go away, cause he believed that these exercises might help him. Then holidays came and he went on a summer camp, but he had to be taken back home because instead of having a great time he was writhing in pain. They had to seek help of other doctor. Małgorzata will never forget this moment when he anxiously looked through the test results. She asked him: „What's going on with my son?” he answered: I'm not sure, I don't want to scare you.” They left the surgery with the referral to Oncology and Haematology Unit. There are no pots in hell and there isn't hot. Hell is cold and sterile clean. White hospital rooms, the clop of nurse's clogs and an empty bed where just yesterday this bald child was lying – that's hell. There's just stinging chemistry instead of tar. But there aren't any devils. There are angels. Caring doctors and committed nurses. The first tests were good, nothing indicated Cancer. Besides, the symptoms were atypical, the doctors suspected spine injury. They wanted to make sure so they sent the samples to Zabrze – the best laboratory in Poland. Małgorzata believed this diagnosis is accurate. When the test results arrived, she couldn't even cry. She stared at the wall and was silent. What can a mother say when she finds out that her child is dying? Leukemia. One of the deadliest cancer. Vicious and cruel disease which kills especially children. 54 percent of Kamil's marrow was infested. Chemotherapy is sufficient when the test results drop below 30 percent after 15 days. Unfortunately it wasn't this case. 15 days passed and 34 percent of Kamil's marrow was still infested. Only a bone marrow transplant could save him. 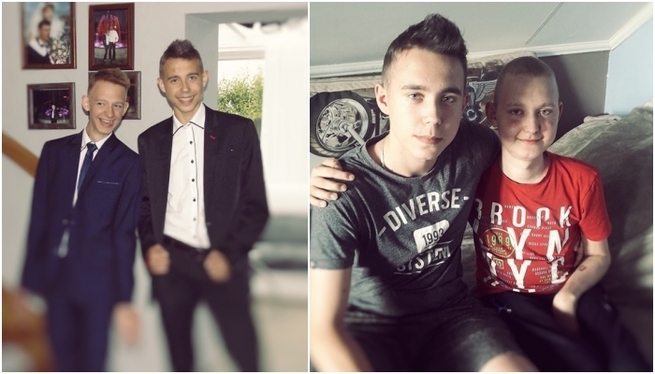 When Kamil was in hospital, the thing he expected the most was his elder brother's visits. His best pal and friend. They did everything together, they were always loyal, they could go through fire and water for each other. When his elder brother was with him, his pain became more bearable. He never cried when his brother visited him, he felt ashamed. Konrad his brother gave him the power and encouragement. Now he could also give him his marrow. When it appeared that there's a compatibility between them and Konrad can be the donor, he promised to give him the best marrow in the world, so he could stay healthy forever. From now on the doctors had only goal - to weaken the cancer to make the bone marrow transplant possible. Long-term course of chemotherapy started. 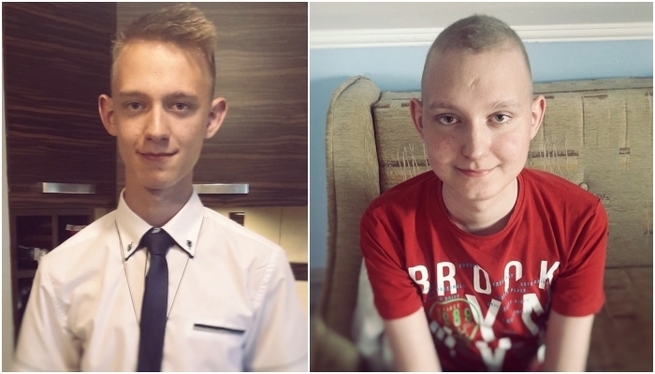 Kamil lost his hair, became pale and only his smile could tell that he used to be a light-hearted boy. His mother watched over him day and night, she was also there that dreadful day. Kamil was just having, one of the chemotherapy courses, he was sitting. She was next to him when he had an attack. He stopped breathing and his heart stopped. The doctors resuscitated him. The boy survived, but couldn't be treated with chemotherapy because of the allergy. Subsequent medicines didn't help Kamil. The bone marrow transplant isn't taken into account because Kamil is too weak and the transplant would be rejected. The boy becames weaker and weaker. He stops smiling. He is impatient. He asks about the date of the transplant. He is tired of hospital, drip and pain. The doctors try different chemotherapy but it doesn't work, it only makes things worse. Doctors spread their arms helplessly. Kamil keeps asking: ”When will I be healthy again, mum?” But she doesn't know the answer. This disease is not only distroying her son but her as well. She used to solve all his problems but now she's totally powerless. When it seems that there's no hope for Kamil, doctors from Wrocław inform Małgorzata about the last chance medicine. It's very effective and strong but it's non refundable. If he were eighteen, it would be refundable. It costs 400 000 zl. When Małgorzata heard that amount, she thought she misheared, maybe 40 000 zl, maybe somebody made a mistake and wrote too many zeros. When she heard about Blincyto she felt hopeful. But when she realised she would never be able to pay for it, this hope died.